Sometimes we just need to get away from it all to somewhere new. Somewhere where we can truly relax. Whether that's on the beach with a cocktail, or enjoying some fine dining in the countryside, we’ve rounded up some of the best luxury holiday destinations to give you some travel inspiration for your next getaway. Relaxing is all about getting away from the stresses of our hectic lives, and for some that could mean a spa break, lounging by a pool, or taking part in an activity or sport. Whatever your perfect getaway is, there’s no better way to do it than in luxury and style. We’ve picked out some of the most luxurious destinations and hotels around the world, so if you’ve got a special occasion coming up or you simply want to treat yourself, here’s a few ideas! Some say it’s the world’s most luxurious hotel, and we can see why. This is a 7-star resort and it’s situated on its very own island. With 9 restaurants, 2 pools and 32 luxury cabanas, it’s safe to say you’ll be treated like royalty during your stay here. You’ll even get your very own Rolls-Royce chauffer, or if you’d prefer, you can arrive by helicopter. This hotel looks and feels like something out of a bond movie. Floor to ceiling windows with stunning views of the gulf, and rooms fully equipped with the best high-tech gadgets such as iMacs, massive TV’s, and Bose sound systems. You’ll have complimentary access to the spa and free water sports on the beach, so you never even need to leave the resort if you don’t want to. It’s the perfect place to unwind and indulge. The Maldives is a little slice of heaven on earth, and Como Cocoa Island will make you feel like you have the island all to yourself. Only accessible via speedboat, this resort is made up of 33 water villas that see you sleeping on the ocean amongst some fantastic marine life. Each villa is light and airy, with unobstructed views of the turquoise waters and offers a tranquil environment for you to relax and unwind. You can take part in yoga, indulge guilt-free in the healthy yet delicious menu of fresh seafood, Mediterranean vegetables and other south Indian dishes. The spa offers a variety of treatments and the island also boats 2 private diving reefs and a luxury infinity pool. This is the perfect little retreat for couples of those looking to escape the digital world and reconnect with themselves. If lying on a beach isn’t your type of relaxation, then perhaps an adrenaline-fuelled ski holiday in the Alps is. Whether you’re a seasoned skier or not, you’ll fall in love with Riffelalp Resort 2222m for its cosy rooms and stunning views alone. Here, you’ll be able to ski from your doorstep (literally), as it is located right in the heart of the ski resort. During the summer months, you can enjoy beautiful hiking and cycling trails, or explore the area via the world’s highest tram route. Non-skiers can also enjoy luxurious spa treatments or take a dip in the heated outdoor pool while soaking up the breath-taking mountainscapes. The hotel is family friendly and you’ll be able to hire all your ski equipment or bikes from the resort. The Seychelles is known for its gorgeous white sandy beaches, yet Le Chateau De Feuilles resides at the summit of Pointe Cabris, making it a romantic little hideaway with some incredible views. The interior is minimal, and its secluded location makes for a peaceful retreat where you can top up your tan and catch up on your favourite reads. If you want to get out and about, there are some excellent golf courses on the island and you can take advantage of a variety of land and water sports. The Chateau feels exclusive and the service is said to be exceptional. There are a range of cuisines on offer for breakfast, lunch and dinner, and each of the ocean suites boast views of crystal-clear waters and romantic sunsets. Stay here for effortless grandeur and guaranteed sunshine. Perfectly located in the heart of Manhattan, with panoramic views across central park, this hotel is within walking distance of all the main attractions. You’ll have Times Square and the Rockefeller Centre right around the corner, and the best service on hand to advise you on what to do during your stay. If you want to stay in, the hotel has a spa with 10 different treatment rooms, and there are two fantastic in-house restaurants with outstanding cuisine. If you want to go off the beaten track but still want a touch of luxury, then Bubble Lodge in Mauritius is one of the best ways to spend a week being at one with nature. 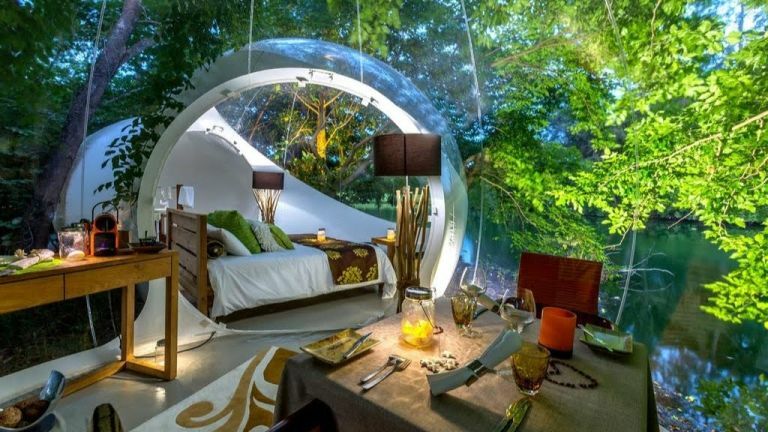 This unique glamping-style hotel set up is located just 30 minutes from the airport on an old tea plantation, and you’ll literally be staying in a bubble under the stars. The transparent lodges offer 360-degree views of the surrounding nature, and each one is surprisingly spacious, accommodating two adults and two children, with a private bathroom, dining room and bedroom. You can really escape reality and enjoy a serene breakfast overlooking the lake, and there are plenty of complimentary activities included such as kayaking, paddling, fishing, and of course, tea tasting tours! Nothing says chic and luxury like the French Riviera, and you’ll feel like an A-list celebrity when you stay at the Royal-Riviera. This 5-star hotel resides on the peninsula of Cap-Ferrat with stunning views of the Mediterranean from the terrace. Here you can relax by the pool and work on your tan, or sip on fine wine and take in the panoramic views. The hotel is perfectly located just a short distance from Monaco and Nice, meaning you can experience everything the south of France has to offer. All guests have access to their very own private beach, and the hotel also boasts a heated swimming pool, spa and hammam. Perfect for a luxury weekend break in Europe.